My name is David Etherington I'm a sole trader providing professional pest control Leeds and pest prevention services in Leeds, Ilkley, Otley, and Wetherby under the name trading name of Pestek Pest Control. I have been trading since 2008 and am a full member of the BPCA and have hundreds of happy customers. Pests including Rats, Mice, Wasps, Ants Beetles, Fleas, Bed Bugs, and Moles, can all be successfully eradicated. Listed below are some of the most common questions I receive from my customers. Do I drive a discreet vehicle? The vehicle I use for pest control in Leeds is un sign written. No one will know I am setting mouse traps, rat traps or applying pesticide in or around your home or business. Do I provide free quotes? I will ask you a few questions about your annoying pest problem and in most cases will then be able to give you a fixed price to eradicate the pest or pests over the phone, text message or email. Give me a call on my land line 0113 89 200 20 which directs through to my mobile phone 07977 108 036. If you have found a suspicious looking insect and want insect identification. You can also send me a Whats App message there is no charge for identification when a call out is not required. I have pets and or children is the treatment safe? Safety is my number one priority! unlike many other pest controllers, where making as much money as quickly as possible is the number one priority. A field risk assessment is always undertaken before the treatment begins, The environment, people and pets within the home are considered before I decide which options to use. I always use methods that are both safe and effective. Rodenticides and insecticides are obviously harmful if not used correctly this is why its important to choose your pest controller wisely. Choose a pest professional who is qualified, experienced and who stays up-to date with regulations and current best practice. Do I charge a call out fee? There is no call out fee or any other additional fees added to your invoice, the price I gave during our initial phone or text conversation will be total the price you pay when your eradication treatment is complete. For pests such as Wasps where only one visit is required then will take payment at the time of the treatment. The price for Wasp nest removal treatments in the 2019 Wasp season is �59.50. This is slightly less then Leeds City Councils current price and less than a quarter of the cost of a Wasp treatment from Rentokil. Why choose Pestek Pest Control Leeds? There are many companies providing pest control services in Leeds. However many have very limited knowledge of insect and rodent biology and how to safely control and exterminate them. I continually update my knowledge of pest biology and the effectiveness of insecticides and rodenticides. I undertake regular pest control training, to keep up-to date with the latest pest control best practice procedures and legislation. What's the cost of hiring a professional pest controller? Prices are usually less than those charged by the larger national pest control companies, such as Rentokil or Mitie I guarantee as I'm a sole trader You won't be visited by an inexperienced unqualified pest control technician with little understanding of pest biology, pesticide formulations and current legislation such as COSHH and best practice from the BPCA and CRUU. All the insecticides and rodenticides I use are professional use only and not legally for sale to the general public. This is for good reason, many can if not used correctly cause serious harm to you, your family and your pets. A good pest controller should always advise if a none chemical option would be better suited. Many pests can be cleared without any treatment whatsoever, if this is the case then this is the advice I will give you. Wildlife aware accredited technician certificate. RSPH / BPCA level 2 in pest control. RSPH / BPCA level 2 in pest management. IOSH certificate in managing safety. IOSH Certificate working safely in pest control. City and Guilds / NPTP PA1, PA6 & PA6W. Full member status with the BPCA British Pest Control Association. I provide 100% guaranteed eradication treatments for household and garden pests. Pest control is seasonal and different pests are more active at certain time of the year. I usually start the year dealing with Rats in gardens, kitchens and lofts. Rat traps and anticoagulant rodenticides including Difenacoum, Bromadialone and Difethialone are used To get rid of these annoying and troublesome pests. Spring time brings the start of the insect season. Ants are the most common pest at this time of the year, insecticides including Imidacloprid a Neonicotinoid is one option. Other options including pesticide free natural pest control treatments can also be undertaken. Summer time means its Wasp season and the busiest time of year for pest control in Leeds. Wasp nest removal treatments often keep me busy until late in the evening, from July right through until November. However some years Wasp numbers can be very limited dependent on many factors including the weather during the spring. Wasp treatments are available 7 Days a week. Rural and garden pests including Moles, can be controlled on either a one off basis (when the damage becomes unacceptable) or on on a contractual basis, where a fixed number of hours per month are arranged in advance to keep pest levels to a minimum throughout the year. If you have a pest problem or want to make sure you don't have one in the future then please get in touch. My personal mobile number which is always switched on is 07977 108 036. If I don't answer your call simply drop me a text message and i will get back to you as soon as I can. I will always reply to text messages. David Etherington - Your Local Pest Control Expert. Did you know... that many pest control operators advertising in the Leeds area have no formal pest control qualifications. This is set to change over the next few years as new legislation is finalised. Until then you would be wise to ask your current pest controller for copies of his qualifications. Or you could simply select a BPCA member to ensure the use of a contractor who can provide a professional and consistent service. 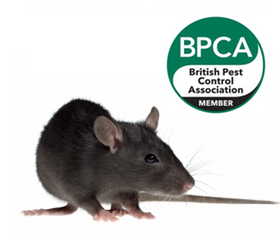 All BPCA members meet strict membership criteria, hold the relevant pest control insurances, and are fully qualified and trained to deal with your pest problems. Rats are a very common garden pest and can turn up at any time of year. However during winter when food is in sort supply the number of callout i get for Rats in gardens in Leeds increases. Why do I have Rats in my garden? If you are having problems resolving your pest problem why not call to get a free quote and explanation of the process I will use to resolve your pest problem. I generally only cover the Leeds area, I am based in Moortown North Leeds.